Have you ever loved a clothing item so much you resort to patching up holes or sewing up tears to prolong its life? Well, the same wear and tear that requires the salvaging of your favorite pair of jeans also affects beloved, important paintings around the world, many of which are made on fabric supports. From the late fifteenth century onward, most paintings worldwide were painted on canvas, a material celebrated for being lightweight and portable, unlike its wood panel predecessor. For centuries, those who cared for paintings attempted to protect them from damage by backing them with another canvas, a practice known as lining. The lining was thought to create a stronger surface and act as a preventive shield against rips and tears. Early conservators used adhesives such as honey and sturgeon glue, derived from the bladder of the sturgeon fish, to glue one canvas onto another—which unfailingly attracted vermin unless used with pesticide. Others used hot handheld irons and wax-resin adhesives to fuse two canvases together, a risky maneuver that could accidentally melt the paint layer! It wasn’t until the 1980s that museum conservators began to steer away from lining after reevaluating the invasive nature of the practice. Conservators embraced a new era of minimal intervention, altering existing artworks as little as possible. While this approach is still considered best practice today, it has come at a price. A growing number of museum painting conservators have little, if any, experience with what were once routine structural conservation procedures, and those who do are nearing the end of their careers. As a result, many conservators feel unprepared to perform safe lining treatments or to repair aging lining treatments on many works waiting in museum storage vaults. For this reason the Getty Foundation is launching Conserving Canvas, an international grant initiative focused on the conservation of paintings on canvas and the continued training of conservators who care for these works. Conserving Canvas aims to keep much-needed skills alive by funding projects that ensure the transfer of knowledge between professionals and the dissemination of historic and current treatment approaches. 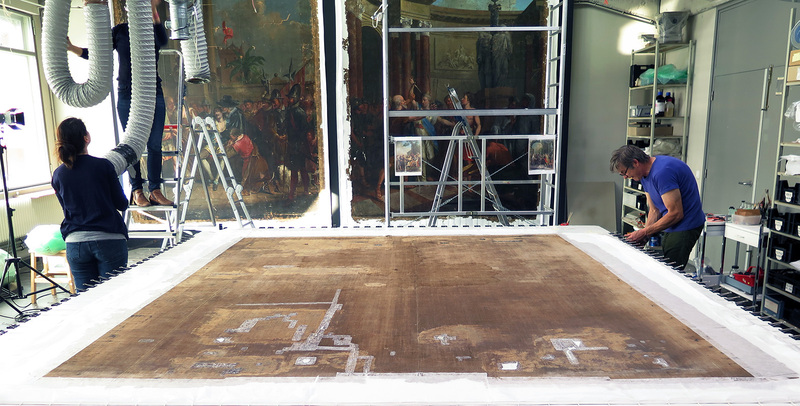 Trainees will participate in the conservation treatments of paintings ranging from Old Masters to contemporary works, seminars, training residencies, workshops, and a major symposium. 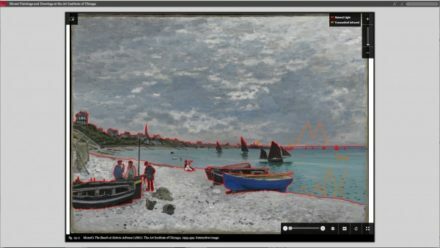 The Getty Foundation is launching Conserving Canvas with seven grants awarded to prestigious international institutions: the Fine Arts Museums in San Francisco; The Huntington Library, Art Collections, and Botanical Gardens; Statens Historiska Museer in Stockholm; Stichting Restauratie Atelier Limburg in Maastricht; National Gallery in London; University of Glasgow; and Yale University. 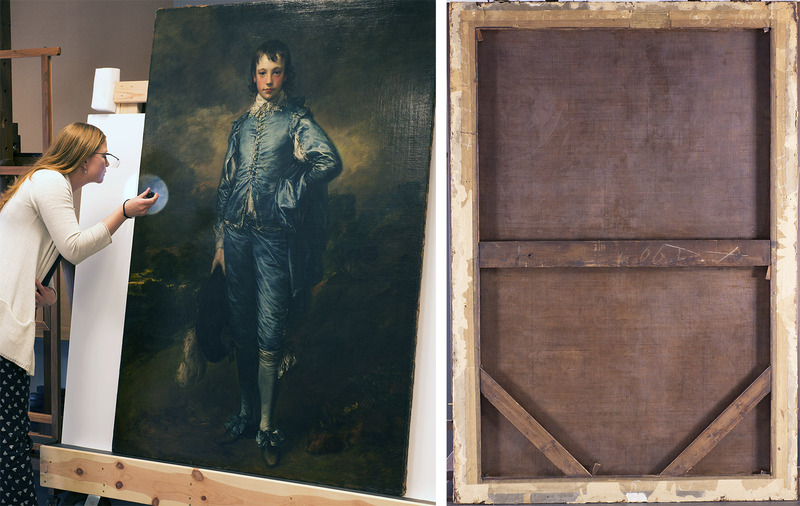 Several inaugural projects include the conservation of world-renowned paintings, including Thomas Gainsborough’s The Blue Boy (ca. 1770), François Boucher’s Vertumnus and Pomona (1757), Sir Joshua Reynolds’s Lady Maynard (about 1759–60), and Anthony van Dyck’s Equestrian Portrait of Charles I (1637–38). 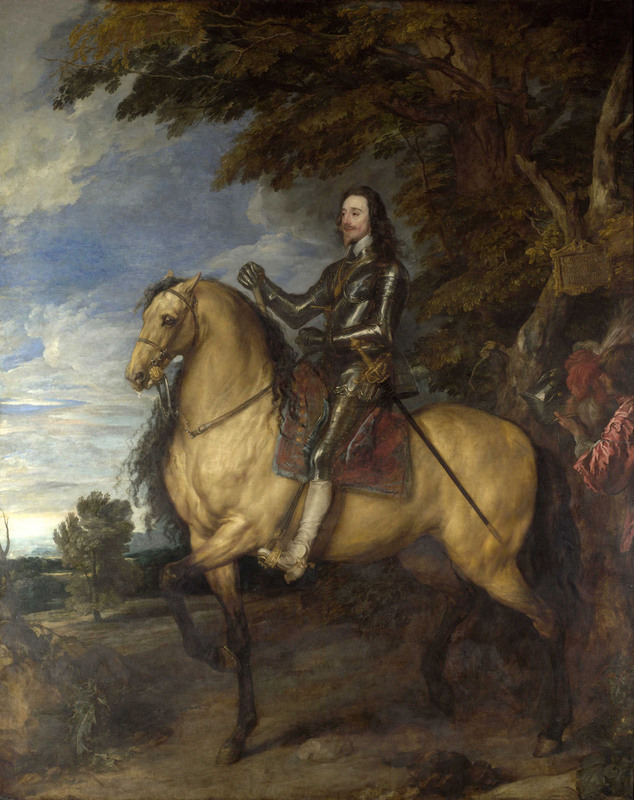 Since its acquisition by the National Gallery in London in 1885, Van Dyck’s monumental Equestrian Portrait of Charles I—which depicts the king as the divinely chosen ruler of Great Britain—has rarely been off view. But while the painting is in relatively good condition, its present lining is failing. Old tears are lifting at the edges, and surface cracks that indicate the painting has been rolled in the past are disrupting the image. Plus, the picture surface is rippled in parts due to earlier treatments. 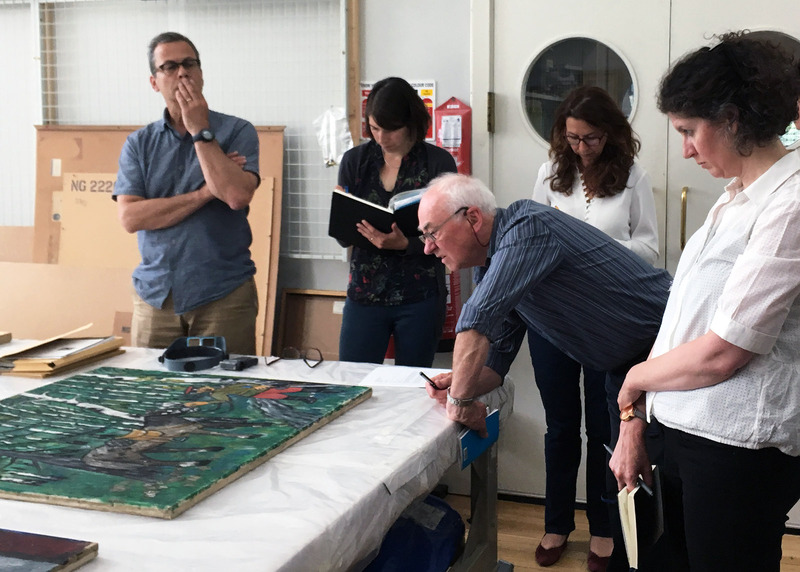 The complex conservation intervention—led by experienced National Gallery conservators—will bring museum professionals from a variety of institutions together to remove and replace the current lining. Other initial Conserving Canvas grants offer seminars in modern conservation techniques such as tear mending, reweaving (the patching or sewing together of torn threads using surgical wire), and loose/strip lining (the hammering of a full lining or fabric strip to a frame to remove tension from the original canvas). 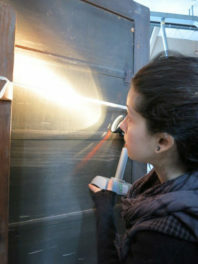 At Stichting Restauratie Atelier Limburg in the Netherlands, a Getty grant is supporting an advanced conservation workshop on mist lining, a minimally invasive technique developed in the 1980s to stabilize paintings on canvas. Mist lining involves adding an adhesive to a new lining canvas that, once dry, is activated with a solvent and then gently pressed onto the back of the painting. 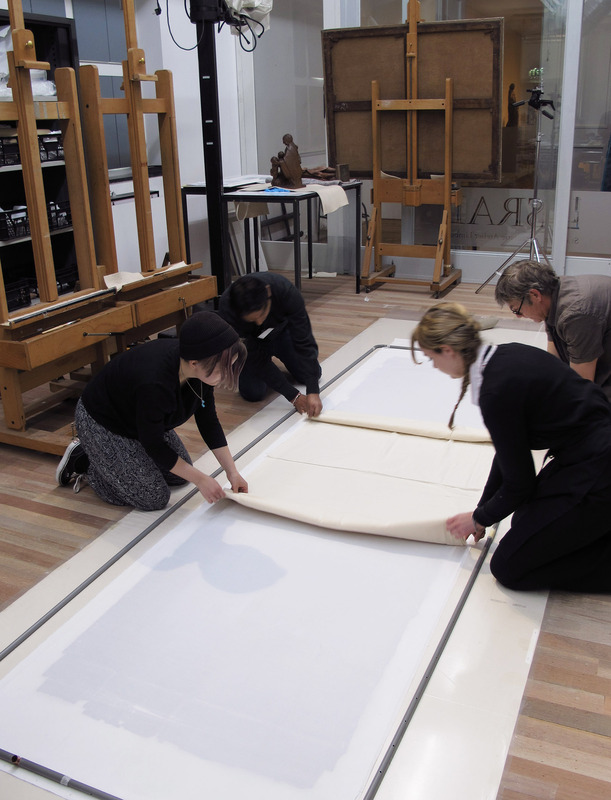 Since mist lining is still a relatively new technique and not yet part of many conservators’ toolkits, the advanced workshop is especially timely for the field. A grant to Yale University will support a major international symposium on the conservation of canvas paintings in 2019. Nearly 45 years after the landmark 1974 Greenwich Lining Conference, which set the stage for modern conservation practice and where discussions on the efficacy of lining ultimately led to the practice’s decreased popularity, practitioners are looking forward to convening on a large scale and taking another broad, bird’s-eye look at their field. The Getty Foundation looks forward to participating in this movement and partnering with institutions around the world to take a major step forward in advancing the future of the conservation of works on canvas. For more information or to submit inquiries for consideration, organizations may contact conservingcanvas@getty.edu. Please note that support is not available for individuals. sono un restauratore fiorentino e mi occupo da 20 anni solo di interventi strutturali su dipinti su tela , trovo la vostra iniziativa molto interessante, rimango in curiosa attesa di sviluppi. Thank you, Lorenzo, for your comment. Stay tuned to our website, our Facebook and Twitter (@GettyFoundation), and the Getty Iris for updates as the initiative progresses. As an artist I find this information is totally interesting. Thanks for the article. My real concern is how to prepare my mixed media collages so they don’t degrade. and what to use as a protection(they are not framed) is unknown. Hi Elaine, thank you for sharing about your art. We recommend you visit http://www.conservation-us.org/ to access a variety of resources and to get connected with their community of artists and conservation professionals.